Through the Shadows by Carroll Blair is a collection of poems about life, plans, commitment, change, motivation, creating and creativity and so much more! It is comprehensive and encompasses all aspects of our lives nowadays with our questions, pondering and need to understand the meaning of life. Most of the poems help to answer these questions, discuss why we live and how we can be better. 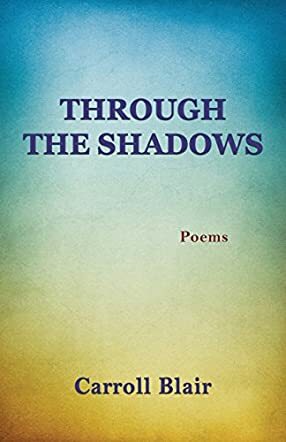 Through the Shadows by Carroll Blair is, above all, an amazing and original collection of poems which, as a teacher of American literature, moved me. I teach Langston Hughes, Rita Dove, and Emily Dickinson this year and these poems could very well be added to my syllabus as they would add a different view on the struggles we are all facing within ourselves. I particularly enjoyed "Cusp of Change". Let me quote it: “On the cusp of change / [profound change] / everything seems / to go still / like a quiet / that’s never been / before in a place / that never was”. I also loved “Silence” which is defined as “the womb of all creation”. I could not agree more! “Do not bind yourself” is extremely moving too and would be perfect to teach teenagers: “Do not bind yourself to the goals of death […] / Not even yourself to your life […]”. It is so true and inspirational! Carroll Blair’s poetic expression is indeed unique and striking. His poetry compels you to think your life over and reflect about how you have been leading it. It is beautiful but also a gift. To conclude, here is one of my favourite quotes: “How often man continues to do / things in ways that are obsolete”. I highly recommend this collection.